Turn on your Yoder Smokers YS640 Pellet Grill, but do not press the “start” button. This will allow the fans to run without producing any heat. Fill an A-Maze-N Tube Smoker with cherry and pecan pellets. Place on the main cooking grate, on the left side. Light with a torch. Close the lid on the smoker. Season the duck legs generously with the Noble Saltworks Flaked Smoked Finishing Salt and freshly cracked salt. Place the seasoned duck legs on the second shelf of the grill. Cold smoke the duck legs for one hour. Remove from the grill. Place in a baking dish with the garlic, thyme, bay leaves and juniper berries. Massage the seasonings into the duck legs. Wrap tightly with plastic wrap. Place in the refrigerator overnight; up to 24 hours. Preheat the Yoder Smokers YS640 Pellet Grill to 300ºF, set up for indirect grilling. Remove the duck legs from the baking dish. Brush off the excess salt. Preheat a Lodge 7 Quart Dutch Oven. Melt a few tablespoons of duck fat in the dutch oven. Sear the skin side of the duck legs until browned. Add the seasonings from the baking dish, and enough duck fat to fully submerge the duck legs. Cover with the lid. Transfer to the grill. Cook until the meat is very tender, and nearly falling off the bone. The internal temperature of the meat will be around 195ºF. Remove from heat. Cool, with the lid off, to room temperature. Place the lid on top and transfer to the refrigerator. Let sit two days. Remove the duck from fat. Sear in a hot skillet to reheat. Strain the solids from the fat. Reserve the clean fat for future use. Chef Tom, This looks Duck Confit looks amazing! I’m planning to make for my in-laws in a couple of weeks. On Tuesday, I made your smoked barbecue brisket, garlic smashed potatoes, and cheesy pastry asparagus wraps for 10 friends. The only problem was they left no leftovers! (nice problem to have!) I currently have a 3 pound Alaskan King salmon filet maturing under you cold smoke brine in my refrigerator. I caught this Silver on the Kenia River, AK last September and I’m planning to make your salmon chowder with a portion of it. 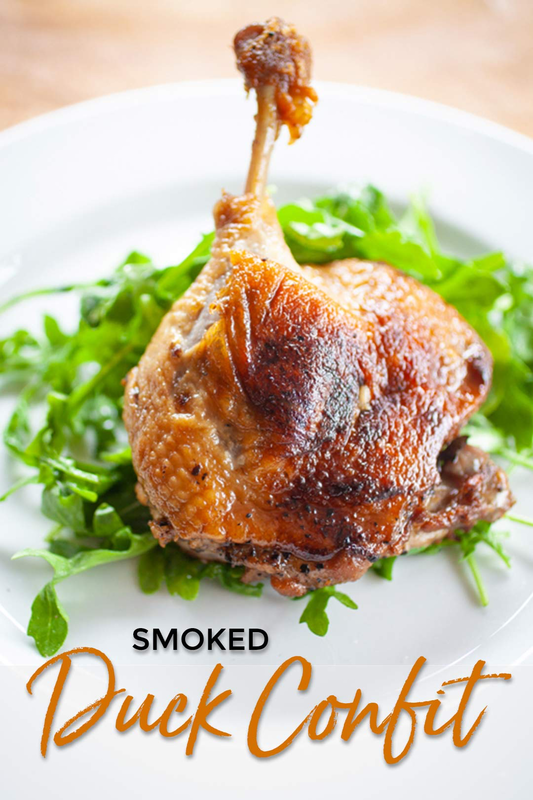 Back to the duck confit, I do wonder what you would suggest to do with the rest of the duck? Lastly, how many ounces of duck fat would you recommend someone buy to cover the duck legs.